Is it my birthday no is it Christmas no, well why am I getting such beautiful surprises in the mail of late? The other day I got a sweet package from Carol at Art and Sand you can see that sweet surprise here. Today in the mail I got another wonderful package. It was from my good friend Susan at Must Love Junk. She sent me a little package of goodies just to be sweet. How nice is that? I thought I would share with you what she sent and say a Big thank you to her and give her some bloggie hugs!!!!! Look at all the sweet goodies in this box. She sent me these adorable pumpkins made from recycled sweaters. Tooo cute. White chippy old keys, and the crown on stone. Look at this cute little calendar with my initial and the old keys. So cute and those clothes clips with the bling, oh man love those. I just love the friendships I have made in Blog land. So much talent and so many special caring and sharing people. Thank you Susan for my special package today. You are the best and I love that you sent me this nice little treat. You made my day. Great treasures! And I love how you displayed them. Kris, you have become such a dear friend, and this is just a small token of appreciation for your friendship! I absolutely LOVE where you put those pumpkins-that's the cutest display!! What a great great blog! I love it and am now happy I bought the Aug/Sept/Oct copy of "Artful Blogging"!!!! I have become a "follower" for sure! Enjoy all those wonderful treats...the pumpkins are way sweet! What a sweet and beautiful gift! They look perfect in your home Kris! How sweet! And LOOK AT THAT LAMP! How cool is that! I love how you have all those things displayed! SO talented -YOU! Super Cute!!! And I love your lamp...did you make it? What great goodies from Susan. Love those little sweater pumpkins...so cute!! Isn't it fun to get surprises from our blogging sisters. What a nice surprise! Wow! I'm seeing lots of white pumpkins this year, just love them! You are loved! xo Have a great week Kris. Love the sweater pumpkins . . . love all the sweet things from Susan . 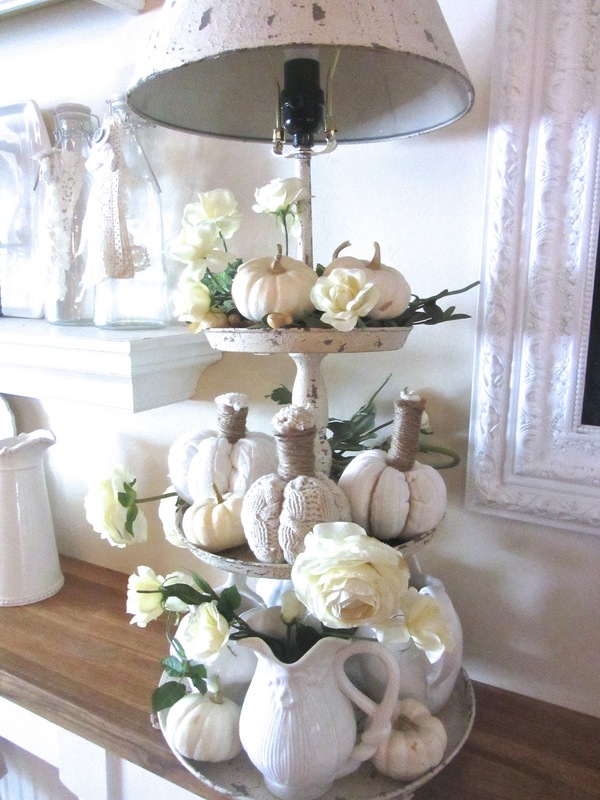 . . love the pumpkin arrangement. And, I am so jealous of your new chair. I can't believe you painted it. I wish I had a spot in my bedroom for a sweet chair like that. Who cares if you can't sew when you have the talent and vision to take that chair from dated to perfection. How sweet everyone has been to you...but I know you are sweet as well to everyone else. Those little pumpkins are adorable! I am making ones similar to those from my Mammaw's old sweaters. Love how you've decorated with them! How many sweet goodies! The pumpkins, the key are adorable. I love the way you dispalyed the pumpkins. I agree with you that in blog land we can meet special pleople. Susan is wonderful...but you know that! I love what you did with the sweater pumpkins. That whole lamp is to die for.